Hey everyone! I have been busy the past couple weeks with the start of my new quarter. I have not been able to search around for product comparisons but here is a quick, simple, and affordable recipe. This must have taken me less than 30 minutes to prepare and cook! All prices listed are from my local Trader Joe’s and total amount for ingredients was around $15. This recipe should make multiple portions and is easy to edit depending on taste. I have started to make meals in large amounts so I have less time to spend in the kitchen during the week. Pasta is always great to have on hand. Trader Joe’s offers many different kinds for around $3. 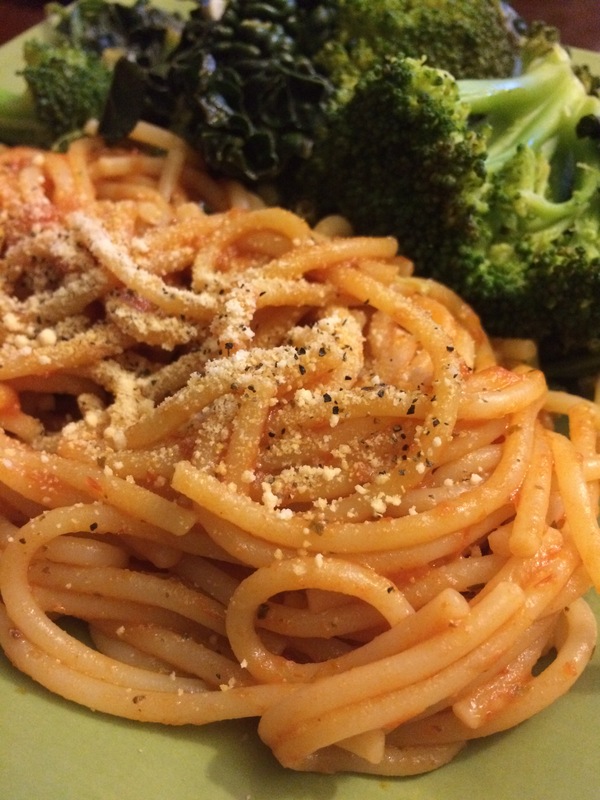 This recipe can use any sort of long straight pasta but I had spaghetti on hand. The pricing goes as follows: A non organic lemon $0.39. Two non organic garlic bulbs are $1.29. TJ’s Tomato Basil Pasta Sauce is $1.79. A bag of organic baby spinach is $1.99. A bag of organic kale is $2.29. Organic broccoli bunch is $2.49. Put a large pot of water on to boil and add only 1/2 teaspoon of salt. While waiting for water to boil, ready a steam cooker (or a large lidded saute pan if you do not have one) with one inch of water and last 1/2 teaspoon of salt. Set to boil. Rinse the spinach, kale, and broccoli. Can keep spinach and kale whole or cut into smaller pieces. Set aside. Place spaghetti into pot once the water is boiling. Let cook for about 8 minutes or for however long instructions on packet say. Place greens, garlic, and lemon juice into steam cooker. Steam for 2-5 minutes, depending on how crisp you like your broccoli. Set aside. While greens are cooking, strain your pasta. Once strained, add back to pot with pasta sauce and mix well. Serve pasta with a side of greens and enjoy! Spaghetti and steamed greens are a perfect pair! I hope you enjoy this recipe as much as I do. Would love to hear variations or what your favorite veggies are to steam.